Colors Mobile Nepal recently announced a new budget-centric smartphone series in Nepal, the S-Series. 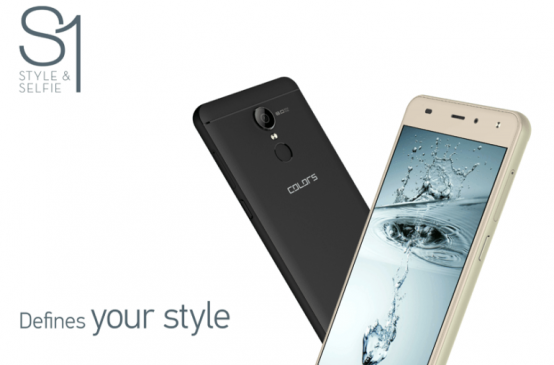 The new S-Series kicks off with the launch of Colors S1 smartphone. Priced at Rs.9,995, the Colors S1 is an entry-level smartphone that comes with a premium build and a fingerprint scanner. In terms of hardware specs, The new Color S1 has a metal body construction featuring 5-inch HD IPS display with a resolution of 1280 x 720 pixels. The display is protected by 2.5D curved glass on the front. Inside, it is powered by a 1.3GHz Quad-core processor coupled with 1GB of RAM and 8GB internal storage that can be further expanded up to 128GB via microSD card. The phone comes with a 2,400mAh battery and runs on Android 7.0 Nougat. The fingerprint scanner is placed on the back panel of the phone. Additionally, the S1 also comes with Colors Lite Data saver feature seen on the other colors smartphones which will help you save a lot of data. Buyers will also get a tempered glass and safety case completely free upon purchase. Connectivity option includes Dual Sim, 4G, Wi-Fi Direct, GPS Support and micro USB port. Talking about the camera, the S1 packs an 8MP rear camera with LED Flash and a 5MP front camera with Flash for capturing selfies. So, If you are planning to get a smartphone with premium feel design that doesn’t cost too much, then the Colors S1 is worth taking a look.